This morning at church, as we entered the “praying” part of the service, the young priest said, “And we offer prayers for those who are in ‘a Season of Sadness.’” He gave a name to something I’m experiencing; a Season of Sadness. A season to journey through. To accept as a stretch of time, but not to define the rest of my life. Like a spell of bad weather, something to endure, to get through, in anticipation of other seasons. My husband would have turned 64 on Friday. Today we would have celebrated with our children and friends, as we have done for years. Homemade cake, BBQ in our back yard, obligatory photo-op … but this year is birthday passed in quiet remembrance of what we’ve lost. A few texts and phone calls, but that was it. Husband, father, uncle, friend. Quick to laugh and quick to fall asleep. Perfectionist to a fault, yet generous and eternally optimistic. His presence is missed, and his absence cannot be avoided. I could never imagine my life without him, without his warmth, without his ideas, and without HIS strong opinion. My arms are empty, and my bed is cold. We struggle as we adjust, yet he is at rest – peace. The peace he could not find here; demons, history, regrets, failures, all plagued him. Yet in our eyes he was wise, kind, and generous to a fault. Ever present and always ready to do more. My mind drifts to the things we never said, and the missed opportunities. It all makes me very sad. I’ve heard it said, “It is easier to escape a presence than an absence.” I have found this painfully true. For there is always the grief, thick and inescapable. A cloud that lingers, a mist, or perhaps an aroma. A sudden familiar smell or a favorite color … grief is a thing that defies words, for words are feeble, thin, constricting. Yet there is a strange comfort in the presence of constant grief – it is a thing you know. It must be invited it into your life, for it will accept no rejection. There have been days where grief has been my only companion. Something “other,” yet my very “self” at the same time … how this is, I cannot explain, I only know this has been my experience. Yet, in deep grief I have found hope, a thing that is also something “other,” yet NOT myself. 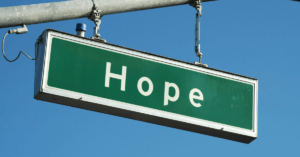 Hope is a thing that is as equally explainable as grief itself. Oh, yes, my dear friend, there is more than enough to say about this dance between grief and hope. I don’t mean to depress with my writing, I merely want to express my experience, so that another might read and say “Yes, this is my experience too.” And through this connection find peace in knowing that you aren’t alone. What about you? 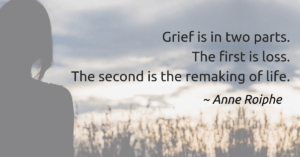 What is your experience with grief? Have you found hope in the depths of your grief? Send me an email, tell me about it. Together we can create a body of work that will help someone through their own “Season of Sadness.” Thank you for support and I look forward to hearing from you. Curious this week to visit a local bookseller and see an eye-catching journal type thing titled “Letters to Future Myself: Write Now, Read Later.” Very cleverly designed, it was a group of envelopes bound together in an actual book. Each envelope had instructions on it for writing different letters to yourself; “Where I want to go…” “These are my roots…” “It was an extraordinary day…” Once the letters are written you are to seal them in the envelopes and open sometime in the future. The title tag line said “a paper time capsule.” Priced at just under $15, it felt nice in my hands. Not having a cleverly produced book, I simply have the participants self-address an envelope and seal up their private letters. I have a special place at my workspace where I keep the letters and I mail them out a year later. It is a great exercise and one that never fails to surprise. It is amazing to read your own words, written to yourself, in your own handwriting. Hindsight is an interesting gift. Having that ability to reflect on how you were feeling, and compare it to how things actually unfolded. I thought it would be fun to share this idea with you. We don’t need the clever journal, just some paper and an envelope. Before you begin, take a minute and think on your hopes and aspirations for the next year. Think also on the uncertainties the next season will bring. Maybe you have fears and anxiety about an unresolved issue? Maybe something special is going to happen this year? Whatever is going on, capture your thoughts, ideas, and feelings as they are – today. Now, as you write your letter to your future self, be encouraging. Encouragement is important to our mindset and to inner peace. Deep within each of us is the desire to have someone say, “You’ll figure this out.” “You’ll get through this.” Be that person and say encouraging things to your future self. Because we’re doing this virtually, I can’t offer to hold your letter at my desk until next year. So, I had a thought, as you clean up your Christmas decorations, tuck your “Letter to My Future Self” in a box. You’ll discover it next year around this time. I know you’ll find those encouraging words, from yourself, in your handwriting, a welcome gift. Drop me an email or leave a comment here if you’re going to write a letter to yourself. I’ll make a note in my calendar so that I’ll remember next year to ask you about it. If you’ve worked with me before, you know I will. The golden trees in the southeast ridge of the retreat center are alive with deep green leaves. At first they don’t appear to be as tall as they were that autumn of my first retreat here, then I realize they’ve all been “topped.” Where once graceful tappers reached heavenward, there are flat, harsh cuts that stunt them. A somewhat inconsistent yet frequent wind strains their branches as it gusts up and over the ridge behind them. I realize their “topping” was for protection, preventing them from growing too tall and snapping under the force of the gusts. This action by a master tree man intentionally forces new growth down lower on the tree’s trunk. The new growth providing the needed leaves to soak in the warmth of the sun, in turn strengthening the trunk of the tree. I imagine I am like one of these trees. They teach me about my recent season of sorrow and pain. Has God indeed topped me? For my own good? Has my suffering prevented me from becoming too tall, too thin and too weak? Did I need renewed strength within me? I sit and watch the unpredictable wind gust in and around the trees. The fresh mountain air is alive. The trees sway gracefully where the wind would take them, but they are not in danger of breaking. I yearn for that grace and welcome new strength in places I thought I had already grown through. Thank you Lord for this vision. Perhaps as God watches me, I already have a hint of that grace. I struggle inside and cry out to him, yet I have not broken. I bend and sway with each twist and turn of the ever changing gusts of wind in my life. Help me Lord to be flexible and ever dependent up on you whatever you allow to befall me. Dizzy my mind has been of late. A whirlwind of shifting thoughts and feelings. I sit – still, yet I am not. I feel as if all the particles that make up my body, might at any moment pull apart. Leaving where I once was a heap of the smaller pieces my body is made from. Look up, see higher things. The blue of the sky the softness of the clouds. And so I answer the call, gazing upward. I behold beauty that only One can orchestrate, symmetry in the world around me. The trees near me are perfectly outlined by soft white clouds miles behind them. Every bump in their outline perfectly haloed as if by an aura. Each contour echoed in pattern. Yet this pattern can only be seen from exactly where I sit. I am in control. All things are ordered aright. Here on the mountain I have spoken to you clearly: I will not often do so down in Narnia. Here on the mountain, the air is clear and your mind is clear; as you drop down into Narnia, the air will thicken. Take great care that it does not confuse your mind. And the signs which you have learned here will not look at all as you expect them to look, when you meet them there. That is why it is so important to know them by heart and pay no attention to appearances. Remember the signs and believe the signs. Nothing else matters. This has been my own experience, drawing away to be with God. Seeking Him, intentionally in a “thin place.” The richness of meeting him, moments of crystal clarity. Then the obligatory returning to the world. The air does become thick – quickly. Oh the burdens of life. They make His lessons thin, elusive. This doesn’t negate the mountain top experience, it only reinforces the need for those moments and the urgency of practicing what you learn there. To live with the assurance of those things which you know to be true, to record them deeply, to know them by heart. “Nothing else matters,” nothing else. Always we have the hope that our sorrows will come to an end. The blessing of time passing. The psalmist asks that his children see God’s power. Times are difficult, but our children are watching. If we believe the things we know about God, he will redeem our affliction and allow our children to see the glory of His power. Our responsibility is simply to be obedient and step our feet in the paths that we KNOW we must take. A difficult task? Not, if we anticipate God will redeem our suffering. There was a time when Christians desired eternity, perhaps because life around them was awful. Full of uncertainties, injustices, illness, hunger and disease. Through modern technology we have erased most of these issues – and so, we have ceased to long for wholeness, the beauty of a ‘glorified’ being. We’ve traded-in our hopes and accepted a counterfeit of life. In exchange for a longing to return to God, we’ve become satisfied with a transient substitute – believing the lie that the things we can see, acquire and consume will satisfy, and they don’t. We no longer anticipate the beauty that God desires to give us.